Leaving Deepdale disappointed with a 1-1 draw was not an emotion I would have expected before the game but I genuinely felt that we played well enough to win. A cracking goal by Alan Browne had given us the lead towards the end of the first half only for a defensive slip just after the break to give Boro a share of the points that they hardly really deserved. North End were by far the better team in the first half and could easily have gone in two up. But the visitors came back a little after the break although Declan Rudd’s goal was hardly laid siege to. I thought we gave a team at the top of the league a little too much respect, once again and with a bit more belief we could have claimed all three points against Tony Pulis’men. Alex Neil made three changes to the team that started against Blackburn on Saturday with Barker, Moult and Storey replacing the injured Robinson, Davies and the rested Nmecha. North End began in top gear once again and could have been one up in the first minute as Barker raced away only to get too heavy a touch just as he was about to let fly. No matter as North End were in the ascendancy and Tom Barkhuizen had an effort cleared off the line as Middlesborugh struggled to keep North End at bay. A couple of half-chances at the other end from set pieces before Barker raced away and found Browne on the edge of the box. The Irishman moved the ball well and shot past Randolph to give North End a deserved lead just two minutes from the break. North End’s lead barely lasted a minute of the second period after a mistake by Paul Huntington allowed Tavernier to race away and beat Rudd from the inside right position. Barker has a shot at the other end but the goal had rattled North End a bit and the visitors seemed to have the better of it for ten or fifteen minutes. 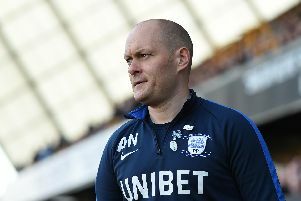 Alex Neil left his sub changes a little later than usual but Nmecha eventually replaced Moult who I thought put an excellent shift in for PNE and his reputation amongst the fans is growing game by game. Preston certainly looked the most likely in the last 15 minutes, with a Storey shot late on the nearest North End came to breaking the deadlock on a night when, with a little bit more belief, we could have taken all three points. So that is nine games undefeated for North End and seventeen points to show for our efforts during this run. Clearly we missed players like Robinson, Maguire and Davies but the boys who came in did a very decent job against one of the sides fancied for automatic promotion from the Championship this season. One big downside to the evening at Deepdale was the attendance which was only 10,990, with just 10,019 home fans – down more than four thousand on the derby game on Saturday. Maybe it’s the red button effect, or the Champions League or maybe its just the cost, but when such a small crowd is in the atmosphere suffers and that was the case in this game. Anyway it is onward and upwards for Alex Neil’s men with St Andrew’s being the next port of call and another tough Championship game at the weekend.